Product description: Lone Star Baby Scandal is written by Lauren canan and published by Mills & boon. 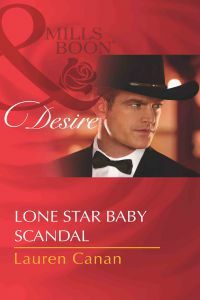 Buy Lone Star Baby Scandal by Lauren canan from markmybook.com. An online bokstore for all kind of fiction, non fiction books and novels of English, Hindi & other Indian Languages. It`s bad enough that straight-laced Sophie Prescott fell for her boss Clay Everett`s charms the night of Royal`s masked ball-now she`s pregnant with his baby! Too bad the former rodeo star turned billionaire entrepreneur`s emotional defences are impenetrable and Sophie doesn`t stand a chance of breaking through. So where does that leave her? And with a blackmailer hounding the town`s A-list, is their secret the next to be revealed? Or is an even bigger surprise in store-that maybe, just maybe, Sophie has discovered the chink in Clay`s armour?